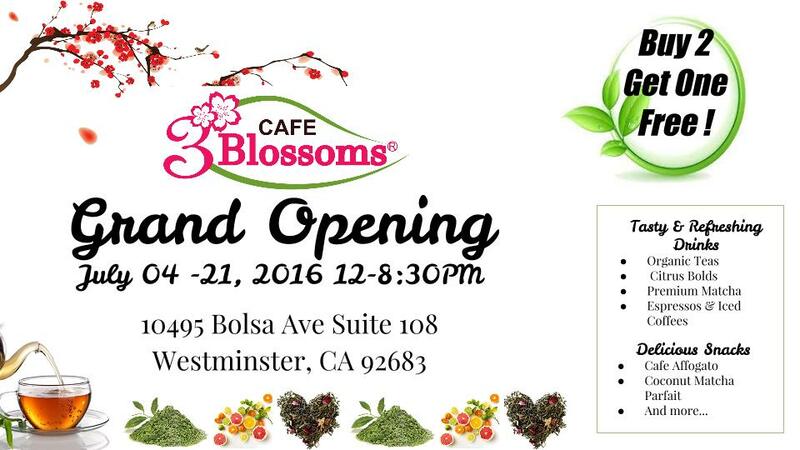 NEW HEALTH CONSCIOUS BOBA SHOP OPENS IN WESTMINSTER WITH BUY 2 GET 1 FREE DEAL UNTIL JULY 21! - EAT WITH HOP! Home / BOBA / CA / DEALS / DRINK / ORANGE COUNTY / TEA / WESTMINSTER / NEW HEALTH CONSCIOUS BOBA SHOP OPENS IN WESTMINSTER WITH BUY 2 GET 1 FREE DEAL UNTIL JULY 21! We cordially invite you to our grand opening! It will begin on July 4th and continue until July 21st from 12-8:30PM. We will have an exclusive buy-two-get-one free offer for those that come in and purchase our items! This offer will be included for everything on our menu. We hope that you will be able to stop by and enjoy our delicious delicacies! Basically here is the deal: Buy 2 get 1 free anything on the menu everyday until July 21! I used the deal and the owner even let us buy 2 drinks and 1 dessert (matcha coconut parfait for example!) So you can buy 2 drinks and a dessert or 1 drink and 2 desserts or snacks or whatever! That's an amazing deal! If you love MATCHA GREEN TEA this is the spot. I got the Matcha Blueberry and Matcha Raspberry shaken teas and they are so worth. I recommend the blueberry matcha! These drinks reminds me of the ones sold at Cafe Dulce in Little Tokyo but thank goodness I won't be needing to drive all the way there to satisfy my matcha - blueberry drink cravings! The drinks here are perfect! They have very unique teas here. The owner even makes the almond milk himself! If you are really health conscious try the homemade almond milk! I don't think it tastes that great with the drink blends since it barely has any sugar and natural almond milk without any of the nasty preservatives tastes a looott different... But give it a try! I was lucky enough to sample some of the drinks here since the owner is super friendly! I came with friends on a not so busy day and the owner was really interested in telling us all about his tea research. It was pretty cool that he is so knowledgeable and wants to shift the tea shop trends to a more healthy one! Try it try it try it!! Especially while its BUY 2 GET 1 FREE!